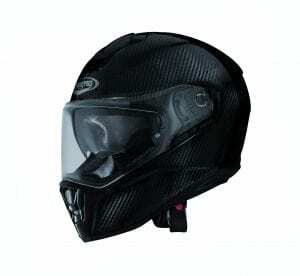 Top Motorcycle Helmets – 11 Of The Best! Is your lid four years old, or older? If so, then it’s time to swap it out, especially if you regularly use it. With that in mind, we’ve collated a stack here for you to check out of some of the very best, so scroll down and get dribbling! We remember when if you wanted a truly top-specification helmet, there was only really two options available to you – Shoei and Arai. Even more than two decades ago, the pair had the best paint schemes (via their racer associations), and the best build quality in the market by a country mile. They also had the prices to match of course, but back then a stunning Shoei GRV John Kocinski replica, for example, was something to really aspire to. Things have changed in recent times though, as technology moves on and becomes cheaper. Now there are a lot more than just two to consider, which makes the choice you make even more personal than ever before. 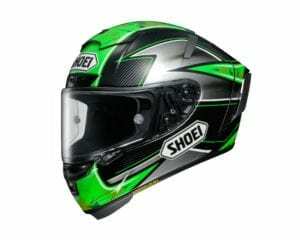 Oh, Arai and Shoei still hold court at the top of the table, but now they have others right alongside them such as Shark, AGV, X-Lite and so on. All their rivals have earned their stripes through superb product meaning that development on nearly every brand is busting forwards at a more than respectable rate. Okay, prices for this cutting edge tech’ will mirror that development curve (And Brexit is adding more than a few quid to the RRPs, too, thanks for that…), but it also means their cheaper versions are also very, very good, as that technology dribbles down. However, here we’re looking at the top-end for sports and track lids, the ones we all really lust after. Here’s a selection of the very best! Shoei really do push the boundaries of development, and as such you always get a brand new (from the ground up) shell construction every few years, like clockwork. The X-Spirit III is their very best, worn by racers the world over such as Eugene Laverty. Its shell is made from organic, multi-composite fibres in multiple layers, allowing top-rate shock absorbing levels and optimum rigidity. It comes Pinlock equipped, in four different shell sizes and has a fully removable lining. The aerodynamic properties are first rate and it has an emergency quick-release system, too. A stunning creation, and available in sizes XS –XL. Remember when carbon lids were all ridiculously expensive? The Caberg Drift Carbon bucks that trend, made from a mix of carbon, fibre-glass and Kevlar. It features a quick-release visor system, and a not-quite-for-us-but-we-get-why-some-may-like-them internal drop down dark visor thingy. The anti-scratch visor comes Pinlock ready, whilst the ventilation has been reworked to keep your noggin cool as the proverbial cucumber. The interior is removable for washing purposes and has space set aside for intercom speakers and a microphone. It comes in sizes XS-XL. How far have Shark come over the last fifteen years or so? It’s remarkable, really, but they do now make incredibly good helmets and this Zarco replica is top of the pile as it’s splashed on the brilliant Race-R Pro. Fagan got hit directly in the head with an entire Fireblade wearing their old version a couple of years back, and he’s okay, so this one can only be better! It’s constructed from carbon-aramid fibres in two different shell sizes and is secured with a Double D-ring strap. The visor is anti-scratch inside and out, including an anti-fogging treatment and the interior can be removed and thrown into a delicates wash. Like most others, it comes in sizes XS-XL. Doesn’t some racing has-been wear this helmet? Joke, Rossi fans! 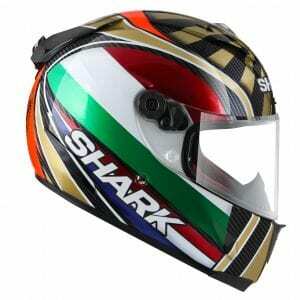 The Doctor certainly has had his fair share of amazing AGV lids and designs over the years, but sometimes simplicity rules and we think this pertinent with the Project 46 V2.0. Featuring a new aero ‘Biplano’ spoiler, the Pista GP-R has moved the game on yet again. It’s fully constructed from aerospace grade, pre-preg carbon-fibre in four shell sizes, and lined with a breathable Lycra fabric. The cheek-pads are custom-fit adjustable, although the metal-vents are always open, so bear that in mind when the heavens go for a piddle! 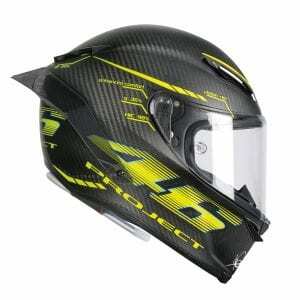 The visor is race-spec 5mm thick, Pinlock ready and, according to AGV, the lid comes with an in-built hydration system. Weighing in at 1,275g, it comes in sizes XS-XL. Another brand growing in popularity is Scorpion, so here they are with their new EXO 2000 AIR EVO, phew… Scorpion’s USP in recent years has been the pump in the chin-guard, which allows you to inflate small bladders behind the cheek pads for a better, tighter fit, and the 2000 is no different. 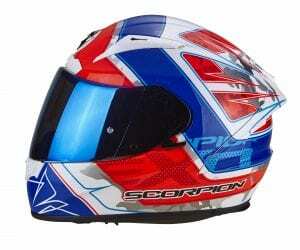 The shell is made from ultra light TCT fibre and has a titanium Double D chinstrap. It comes Pinlock and tear-off ready, and has an extra comfortable lining after the interior was completely redesigned. You get a dark smoked visor included and it comes with a five-year warranty, in sizes XS to XXL. Plain colours are £269.99. We can understand why many turn their noses up at a Schuberth, being that they were synonymous for many years with touring folk. However, it’s time to get over our collective selves, as their track lids have come on leaps and bounds and, if you’ve never worn one before, you’ll literally be amazed at the quality fit and just how quiet they are – probably the least noisy here. The SR2 (£549.99 in plain colours) also has an anti-roll-off system meaning the lid cannot pivot off your bonce from behind. 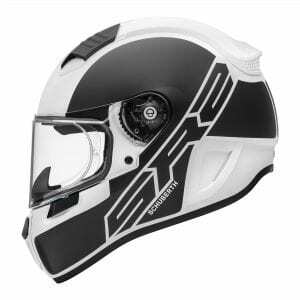 The racing visor is distortion free and secured with a quick-release system, while the outer-shell has been thoroughly worked over in the wind tunnel for optimum air slippage. It weighs 1,285g and comes in sizes XS-XXL. 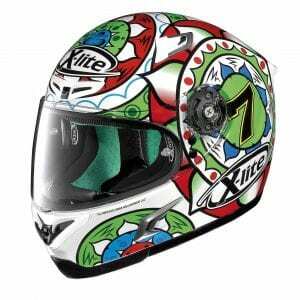 We love a good X-Lite, and if it’s a Chaz Davies rep’ we love it even more! This Imola replica is stunning (as is his Sepang version), and it’s splashed upon an impressive build from a fibre-composite construction in three different shell sizes. The venting has been designed for optimal airflow when things get toasty, and it has removable ‘activated’ carbon-fibre cheek pads and liner. Its visor is scratch resistant and it’s Pinlock ready, while the lid is secured with a good old fashioned Double D-ring. If your bonce fits in sizes XS-XL, you too can be Chaz! 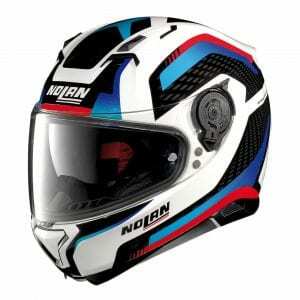 Taking a quarter-turn off the gasser for a moment, comes the Nolan N87. You may think by its price and purview, why is it here? Quite simply, because X-lite and Nolan are one and the same, and a lot of technology that goes into X-Lite’s racing lids is also used here – even though it uses a polycarbonate shell. At under £200, this makes it a bargain. It also comes ready for a comms system, has a drop-down dark visor (ewww…), is Pinlock poised and available in a vast range of sizes, from XXS-XXXL. Featuring a new, lightweight carbon shell, the RPHA 11 Lowin Carbon is impressive to behold. 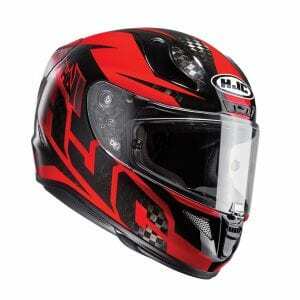 HJC listened to everything their customers were saying, and acted upon it with this lid. The top vents are precision controlled now, the visor aperture has been enlarged and also utilises a multi-point locking system and new quick-release mechanism. Cheek pads have an emergency release feature, aerodynamics have been tweaked, the carbon shell peeks out sweetly twixt the graphics, and it’s available in sizes XS-Xl – very nice indeed! 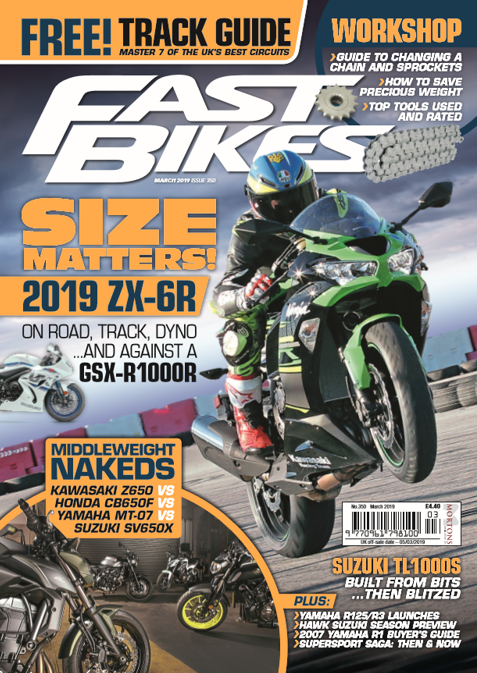 The only manufacturer’s official clothing option out of this lot, the Corse V2 is still based on the new Arai RX-7V lid, their latest and greatest – if you don’t count the full-carbon, £2,499.99 RX-7 RC! It was Arai’s first proper new shell in a long while, but it boasts all of the technology and USPs you’ve come to expect from the iconic brand. 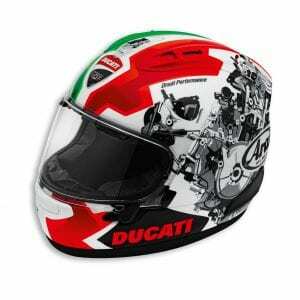 It’s made using a bonded super-fibres in a net structure core, features a variable-axis-system, has a removable lining and, in this instance, comes adorned with technical drawings of Ducati’s 1299 Panigale. 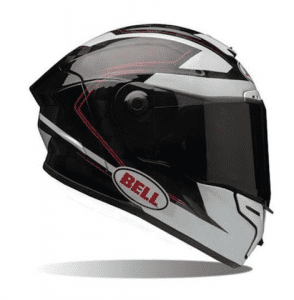 If you don’t want a Ducati themed version, head to www.whyarai.co.uk and you’ll find the same lid but with many other colours, including plenty of race reps.
Must say, we do very much enjoy Bell’s resurgence over recent years, and their latest product is very impressive indeed. The Pro Star range is made from a 3K carbon-fibre shell, with a ‘panovision’ visor featuring class-1 optics. Its carbon construction allows it be very light at just 1,150grams, while comfort is taken care of by a Virus Cool Jade mesh lining. The cheek pads are magnetic and removable, there are five shell sizes and it’s been styled not only for great looks, but also after extensive wind-tunnel testing. It’s available in sizes XS-XXL, and looks gorgeous in the matt carbon version, too. Previous Post:WSB 2018 – Phillip Island In Numbers! Next Post:Evotech Reveals KTM 390 Duke Accessory Line!